Not everyone enjoys garden knick-knacks or yard art. 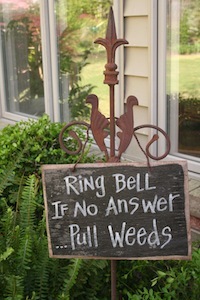 However, done tactfully or tackily, there’s fun in adding inanimate objects to our yard and garden spaces. I say if it makes you happy, go for it! 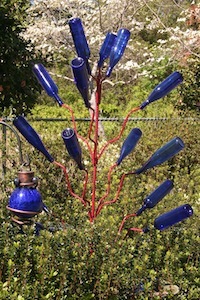 Bottle trees are a distinctly southern yard or garden addition. I have seen some trees hung with bottles by gardeners who didn’t know the story. Their bottles were hung by the neck with wire. 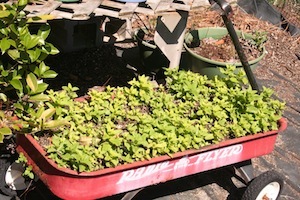 This would never do in a Southern garden because bottle trees, to be effective, need to have their bottles upside down. In this way, they capture any ghosts or “haints” that wonder by. Once inside the upside-down bottle, these beings cannot escape and wreak havoc on the neighborhood. So you see there is a very solid reason for installing a bottle tree. You can even purchase a metal ready-made one and add your favorite wine bottles in the color of your choice. Half the fun is emptying the bottles. In 2009 my neighbor and I were on the local Master Gardener garden tour. 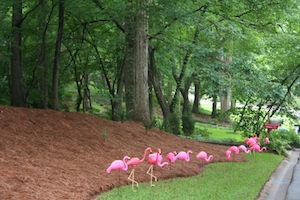 2 days before the tour, her church “flamingoed” her with a large flock of pink plastic flamingoes. It seems a group in the church raises needed funds by surreptitiously setting out all of these birds. They will come and get them once you pay a ransom. I thought they looked marvelous, but she decided she had better pay up and have them removed. 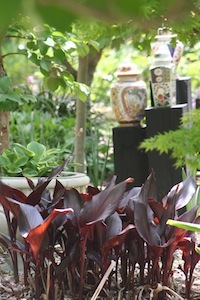 A pretty garden tableaux featuring ginger jars raised up on deep, dark pedestals with the deep foliage of Intrigue cannas complementing them in the foreground. This gardener has it all together. Notice the orange accents on the ginger jars. The Intrigue cannas’ blossoms are orange, set atop the deep, dark foliage of the cannas. This combination echoes the colors front to back.